Did you know HVAC energy usage accounts for 17-40% of a commercial building’s energy usage? Managing these costs with simple maintenance can go a long way to reducing your utility bills and keeping your expensive equipment running smoothly and safely for a long time to come. 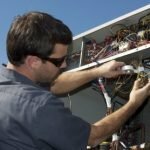 Our regularly scheduled preventative commercial HVAC maintenance programs are designed to prevent costly emergency service calls. We custom tailor a maintenance plan for each individual customer. Give us a call and we’ll help you in any way we can.